Today’s craft cider world is popping the top off the perception of hard cider as a singular, sweet beverage with a uniform taste. The industry is exploding with creativity and an ever-growing range of styles, flavors, and approaches. Nowhere is this more evident than California—a hot spot for cider innovation and production. And with nearly a dozen producers in San Luis Obispo County, the Central Coast is gaining its well-deserved reputation as an industry leader. What’s Inside Our Cider Guide? Today’s cider producers are exploring fresh ways to express the essence of the apple (and other fruits). The resulting ciders are as individual, refreshing, and varied as their makers. 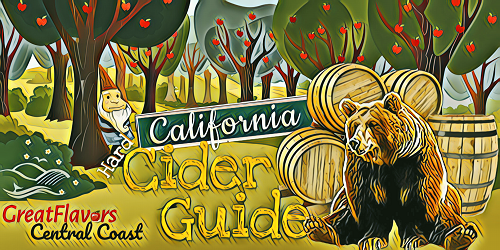 When we set out to create the Great Flavors California Cider Guide for hard cider fans like you, we knew we wanted our guide to be equally fresh. 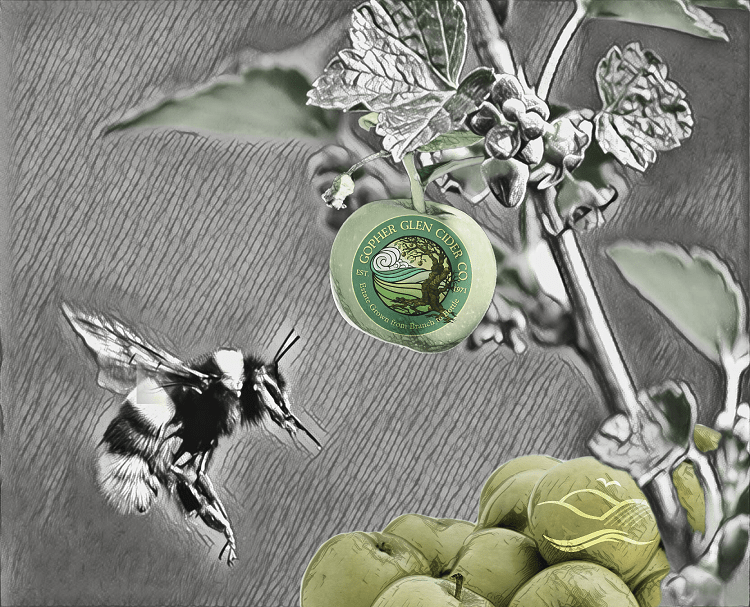 Our promise: to provide you with a resource that’s packed full of the delicious variety of personalities and products in California’s craft cider world, plus information about cidermaking from apple to bottle. So sit back, open your favorite cider, and enjoy your adventure exploring the craft cider world. What led you to creating hard cider? Bristols Cider co-founder Neil Collins has been drinking cider his whole life, and being born in Bristol, England, he knew a few things about hard cider. Back in 1994, hard cider was nonexistent on the Central Coast, so he began to experiment with it by making only a couple of barrels at a time. He used 100% Pippin apples from the North County and was pleased with what resulted. From that point on, he made cider for the Lone Madrone winery tasting room kegerator until cider came on with the public. Do you have a cider-making style or specialty? How would you describe it? We focus on a more natural fermentation using native yeasts. Sometimes, as a result, the fermentation lingers for a long time. We maintain a lot of aromas and flavors that way. We also do a dry style of ciders, accentuating the source materials and letting them shine the brightest. How do you choose which flavors to craft in your hard cider? This has evolved over the years, and we don’t restrict ourselves to certain combinations or styles. That said, we like the way certain apples play with hops, barrels, etc. One of the main things, though, is that we do focus on co-fermentation; i.e., our cider with quince in it is a co-ferment with a blend of apples. What’s your favorite apple (for making hard cider or eating)? Well, we work with over 60 apple varieties, so that’s a hard one. I will say that, across the board, we all love Black Twig and Arkansas Black apples quite a lot. Weston, though, is fond of the Pink Pearl. What’s your cider spirit animal? And why does it best represent you (or your cider company)? 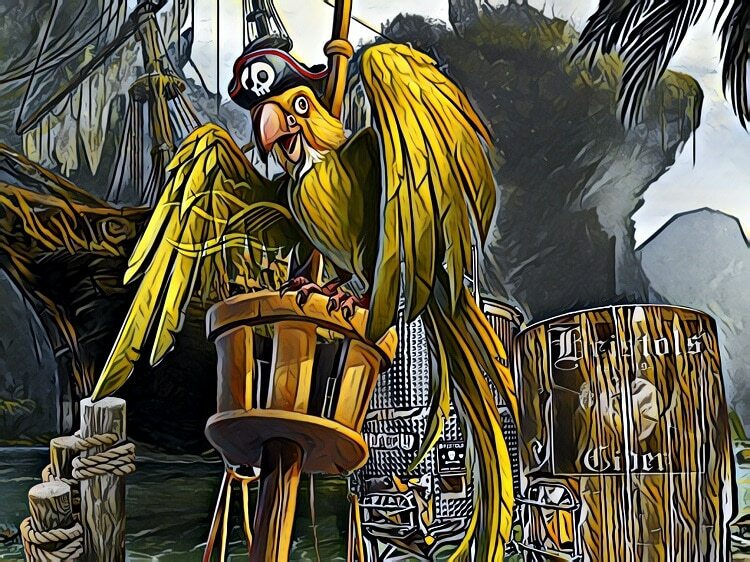 A salty Pirate’s Parrot, drinking the cider when the pirates are looking the other direction. It’s loud, tough and fun! When people think of your hard cider and your company, what is the one thing you’d like them to remember? We would like them to know that we pick and press our apples, keeping the process very personal. Our ciders are dry and intriguing, showcasing the varieties that are involved. Where are your ciders available? We can be found at the Bristols Cider House (where you’ll be able to find ciders not available elsewhere) as well as major retailers in San Luis Obispo and Santa Barbara counties. You can also find our ciders in many restaurants locally. It was only a natural direction to take, with us being one of the larger apple producers of the county. We already make fresh cider, so it was only one step away. Our fresh cider is so good, we had no doubt that it would make a great hard cider. Our cider making style is very classic and raw. We let the natural flavor of the apples and fermentation vessel determine the flavor of the cider. Each year. we will feature a specific apple by itself to see what it tastes like. For example, we used Arkansas Black and it is very unique. We look at the apples with high tannins and sugars, then determine which ones would create a unique flavor in the hard cider. I have many favorites! We do not yet know all our favorite hard cider cultivars. I would guess our list would include Arkansas Black, Newtown Pippin, Spitzenburg, Staymen and Turley Winesap, Gravenstein, Granny Smith, and/or Red Yorking. My favorites for eating include Braeburn, Empire, Jonalicious, Spitzenburg, Heavensent, and Mohawk. The California Coastal Native Bumble Bee. 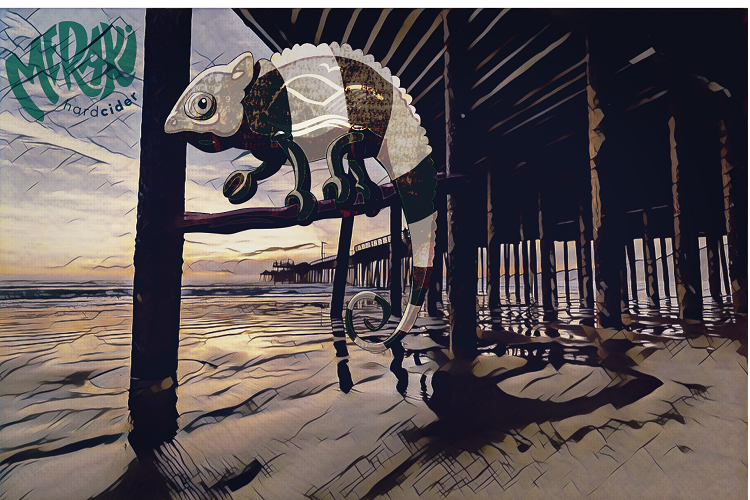 They’re native to the coast and can only be found here in the hills, just miles from the beach. They love the orchard as much as we do, they help drive the survival of the crop, and who doesn’t love bees! Our ciders are pure, naked, celebrate the apples, and they’re made from 100% Gopher Glen organic apples. Our ciders are only available at Gopher Glen Apple Farm. I got into cider production through winemaking. I worked for Neil Collins, owner and winemaker at Lone Madrone, as well as Bristol’s Cider. Neil has been making cider on the central coast since 1994 and so when I got the job with Lone Madrone/Bristols, a large part of the job was cider production. I saw that cider was starting to explode and so I jumped on the small bandwagon and branched off to start my own brand. I would definitely say we have our own unique cider style. I don’t know what you’d call it, but unlike many other brands, we bottle-condition our cider. In addition, we use honey exclusively as the priming sugar. This is unique because most other companies will use a dextrose, or white sugar, as their priming sugar. We also don’t do any oak barrel fermentations or aging, which is stepping away from that winemaking style. When deciding what sort of fruits, spices, etc., to put into our ciders, we honestly just take ideas from all over the place. Branden (my business partner) and I will brainstorm but we also ask friends, family, and the community to throw ideas at us! It’s just more fun that way and then we can tailor some recipes toward what people are looking for. I wouldn’t say I have a favorite apple for making cider because I haven’t been able to make cider with cider-specific apples. We use dessert apples, which work well, but I would love to get my hands on some real English cider varietal apples. They are just so awesome because they have the crazy natural acidity and sugar that you want in cider. As far as dessert apples go, I love using Granny Smith because it does have a fair amount of natural acidity and sugar. My favorite eating apple is Fuji. I would say our spirit animal as a company would be an heirloom cider apple tree. Heirloom apple trees take seven or more years to even begin to mature into a fruiting tree. Just like that tree, we have been growing our company slowly but very organically. I want people to know that my business partner and I literally do all the work. We don’t have a cellar crew, or distributors, or brokers. We design it, produce it, bottle/can it, label it, sell it, and self-distribute it. It takes a lot of time, effort, and money to make craft cider. When people realize that, I think they don’t mind paying a little bit more of a premium for it. People need to understand that it costs much more to produce hard cider than beer. When someone buys a craft cider, they are paying for a truly handcrafted beverage in every sense of the word. We don’t have a tasting room currently. You can find our account list on our website at www.jeanmariecidery.com. 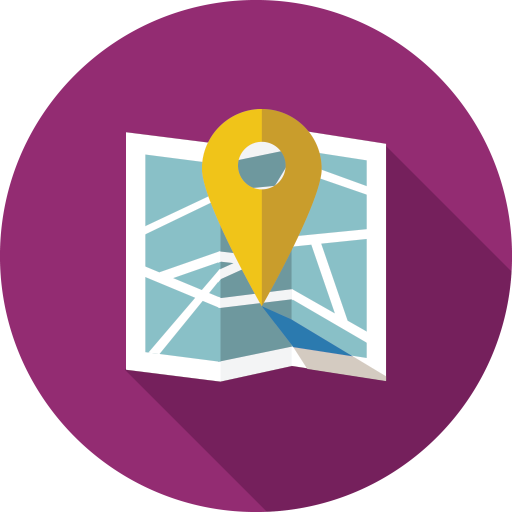 We sell our product in on-premise and off-premise locations. For example, Whole Foods, Gus’s grocery, The Galley restaurant. Funny thing is, our dream of starting a cider company actually started with a dream of opening a brewery. We have a shared love of home brewing that we picked up in between units at Cal Poly. One day we were sitting in front of a bonfire, drinking a cider, talking about our future, and the idea of opening a cidery came up. We both have a passion for fermented beverages, we have access to apple trees, and it’s in our blood (Quincy is related to John Chapman a.k.a. Johnny Appleseed). With so many breweries in the area, we thought cider might be a fun adventure. Little did we know there would be such an explosion of cider companies on the Central Coast! It’s been really fun growing with the rest and spreading our love of cider locally (although you’ll see us spread our love of beer by enjoying an IPA at a number of local breweries as well). We’re all about experimentation and pushing the limits. Cider is still in its infancy (at least here on the Central Coast) and we embrace the opportunity to define what cider is and what it can be. We find inspiration just about anywhere. While traveling in Australia, we picked up the idea of combining lemon and ginger for Waltzing Matilda. While living out the summer in Yuma, Arizona, we got our hands on some pequin chilis that turned into Ignatius. Our inspiration for Forager came from visiting our family for Thanksgiving—there are always heaps of untouched persimmons on the trees at the family farm. We find spice shops and we smell and taste until our taste buds are sore. We love beer and home brewing, so we have been working on using some methods and ingredients that we find in our favorite beers. For eating: Gravensteins from our family farm in Sebastopol. They are perfectly tart and remind us of family. For cider (so far) we’ve really loved the Newtown Pippin apples we use from Julian, California. They make a beautifully balanced cider. The chameleon. Always changing, putting something new out there. Every cider we come out with is different from the last. We can come up with some flashy flavors, but we can also create a classic cider that blends with the rest. Plus, we like to taste things, and one of the main features of the chameleon is its awesome tongue. We want people to taste our cider and think “wow, that’s interesting!” Not every cider will speak to every person, but we hope every person can find one that they can drink a pint of. We also want people to remember that we are truly a mom and pop cider shop. We are so small, all of our production is done from a 10 x 10 ft. “warehouse” in our backyard, which means that we have a whole lot of love and dedication for what we do. It isn’t easy, but the reward of creating something for people to enjoy makes it all worth it! In stores, our cider is currently available at California Fresh Market in Pismo, DePaulo & Sons in Shell Beach, and Órale Taqueria in Paso Robles. We also deliver growlers of our cider and offer kegs for larger events or parties. Simply email info@merakicider.com and we can get something going for you. Reef Points was inspired by trips and travels. We wanted to drink something truly dry and it was difficult to find something in the market at the time. Our company has always been motivated by the place we live in and the friends we spend our time with. Cider is the perfect pairing for the Central Coast and all the beauty within it. We are always craving something cold, crisp, and refreshing to accompany our adventures. Reef Points strives to create bone-dry cider. Traditionally, our ciders are fermented and aged in used red wine barrels and bottle-conditioned for a sparkling finish. We use apples from the Central Coast and use quality techniques that help our products stand the test of time. It’s only apple and fermentation and aging. Flavors evolve from there. We like to keep it clean. Kid Neptune (the young son of Poseidon). Right now, they are available at select retailers, restaurants, and bottle shops up and down the Central Coast. The purchase of a small apple orchard in See Canyon led us down the cider path. Chris our cider maker creates cider with flavor and balance in mind. Our ciders are apple-forward with a tart finish. Our philosophy is that the apple comes first and anything we do or add to it is to enhance the flavor without covering it. That goal is why our Triple Threat Hopped Cider is such a surprise. Many people who don’t like hoppy beverages love the Triple Threat because of its fresh tropical taste. The apple that is near to our hearts is the Heaven Sent apple from Gopher Glen, our amazing neighbors. This is one of the unique See Canyon apples we started making cider with. Our spirit animal is the owl that made its home in our orchard. He keeps a watch over our trees at night. Owls are known to be very wise and I pretend to be that as well. That they had a good time and enjoyed every sip. It’s easy to take drinking way too seriously and we like to make it fun. All over the Central Coast, including most liquor stores and quality groceries. Curt and Andrew and wanted to make cider because it can be a delicious beverage that goes with all occasions. Also, they wanted to have fun with something different besides wine. No boundaries or rules, just being creative and having a blast. All dry ciders with no residual sugar, and are bottle, can, and keg conditioned. Apple wine is really what we are making. Again, this cider project has no boundaries or limitations, so we kick around all different ideas. Cocktail themed, beer hybrids, wine hybrids, bourbon barrel aged. Sometimes our staff or customers can give us ideas and we roll with it. The blend we get can be up to 17 different apples. Some are cider apples and some are dessert apples. I personally like Granny Smiths from Chadmark Farms in Paso Robles. We make a cider every year from this orchard that we co-ferment with grape skins. This last harvest we paired up with Desparada and used Sauvignon Blanc skins. The year before, we used Gewurztraminer from Union Sacre with the apples from this same farm. Pushing the envelope on things and being creative while having a lot of fun. Not taking things seriously. Original Dry Hopped and Poly Dolly are the driving force that you can get in retail and restaurants/bars. Then we usually experiment with another 6-8 specialty ciders in the taproom that we rotate. Depending on how much we make of the small batch/specialty ciders, we release some to the market. We fell in love with heirloom apples we tasted in See Canyon. After pies and apple butter, we decided to try our hand at a batch of cider. In the course of years and years of batches and travels, we tasted/tested many different ciders from all over the world. It took us a while to realize we were hooked—so hooked we decided to start Two Broads, adventures in cider making. We tend to like dry ciders. There is something we enjoy about all the styles: tartness, funk, floral qualities. Like wine, there is a different cider for every change in the weather, season, and mood. We make what we want to drink. Maggie likes kumquats and it turns out that they are really good in cider. Morgan loves hopped cider and did her own take. We study flavor combinations in real life—at restaurants, for example, and in fancy cocktails. Other cider makers inspire us as well. Arkansas Black, Winesap, Burgundy, Empire, and Crab Apples make great cider. We make good cider. This should show how much we love what we do. Look for current retailers on our website; we update frequently. A trip to the Basque County and Asturias in 2011 changed everything and inspired both Hunter and I to produce cider when we moved back to California soon after that trip. Instead of living in San Francisco where we met, we decided to move up to my parents’ Sonoma County farm, Devoto Gardens & Orchards. That’s where Golden State Cider was born, and we started in 2012 with 2,000 gallons of Gravenstein cider that we sold alongside our farm’s apples and flowers at Bay Area Farmer’s Markets. Our two leading philosophies are quality and technology. We like to describe our style as one would describe a CA style wine—juicy, sun-ripened, pure authentic ingredients that make a cider like no other. Our cider-making facility is state of the art with processes / equipment that we took from many different beverage industries and worked into our cider-making process to make a cider as minimally processed as possible that makes the fruit shine. It’s all about letting the ingredients shine. We choose flavors that we like and that go with food we like. Since I grew up on an apple farm with about 100 quirky varieties, I deeply appreciate the apple, so our ciders will always shine the apples as the first ingredient, balanced by whatever flavors we think would go well with that particular variety of apple juice. My favorite ciders to craft are the ones where I have no control over the flavor, only mother nature does. Depends on the time of year: Gravenstein for August, Ashmead’s Kernel for September, and Arkansas Black for October, Smokehouse for November. I tend to like the apples that have a lot going on in terms of flavor. For example, an Arkansas Black, with it’s baseball-like texture and hard skin, has amazing wine-like, gingery, licorice flavors to it. Terroir in apples is an amazing thing. 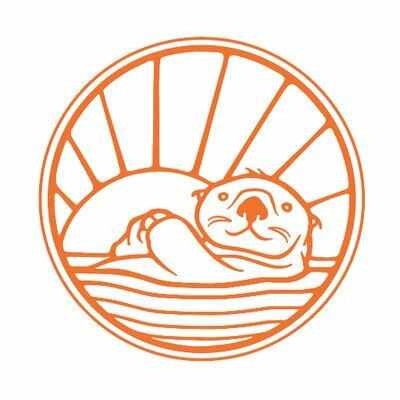 The GSC sea otter, Seamus, is our spirit animal. He’s an approachable, active ocean-dweller and likes to play a lot, just like us. Being healthy and active is something we highly value at GSC, as we offer employees a wellness program in addition to full health benefits, and 3 weeks paid vacation. The more time we have to do what we love, the better and more focused we’ll be in our daily routines. We’re meant to play! Quality. Quality. Quality. We invest heavily in QC procedures, and the quality of our cider is everything and something that our customers can count on. We also want them to remember the iconic cans. GSC is available in CA at Whole Foods Markets, BevMos, Safeways, Total Wine and More. We do not have a taproom or a cidery that the public can visit, as our cidery is part of a large old apple-packing co-op that now houses multiple food businesses. Being an outsider to farming, I was blown away by the work and effort that goes into growing produce for the world to eat. I wanted to do something with the fruit that would both bring recognition and do justice to the generations of labor that has gone into growing our pears and apples. I also happened to love alcohol. I felt the combination of the two peared well. Our specialty is focused around our estate-grown pears. With six generations of farming behind us, we know how to grow high- quality fruit. You can’t make good cider without good fruit! I focus on what we grow and when it tastes the best. I wander the orchards tasting apples, I experiment with ripening pears. I walk the levees, taste the wild berries, grapes, and herbs, and that’s how I come up with new inspiration and blends. It’s actually a pear. And the Perry pear is the best for making pear cider (which is called Perry!). In the UK and Europe, Perry pears are used to make Perry. They are tannic, acidic and not the best for eating, but amazing for Perry. (UK Perry is made from 100% Perry pears.) In the US, Perry pears are very rare, much more so than cider apples. Pears in general are more challenging to grow and can require more management. Here in the U.S., we use dessert pears for pear cider. We use Bartlett and Bosc pears. We are currently growing some Perry pears and look forward to our first production in a few years. The dung beetle. This little creature may be overlooked, but it’s one of the strongest animals on Earth! 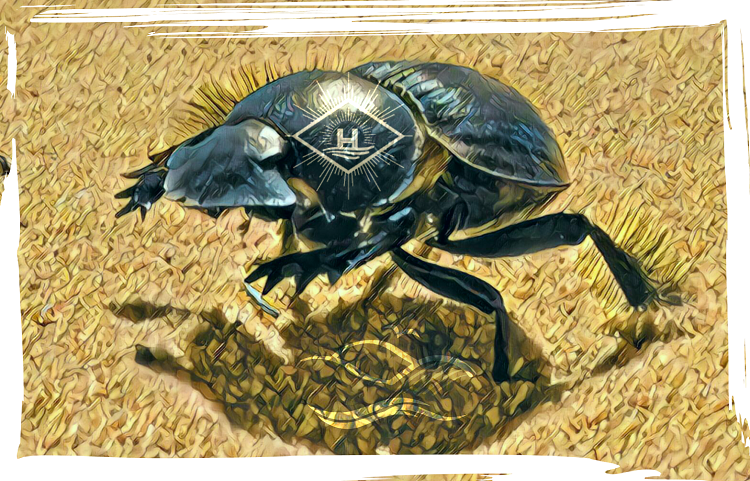 The dung beetle takes a piece of dung and, through brute force and will, transforms it to something useful! That they should pick some up on their way home! BevMo carries our ciders on the Central Coast, or come up to the farm. If your cider company is not listed, let us know! Contact us at engage @ gr8flavors.com so we can include your cider-making profile in the next edition of the Great Flavors California Cider Guide. Our cider map was created to help you get a birds-eye view of our local ciders. Additionally, you can zoom in and use the map to help you navigate to the cider houses that have a tasting room or central location to buy the cider you are looking for. The map is interactive, so you can click on the icon on the top left corner to open up the list view. From there, you can choose a cider producer and that will narrow in on their location. Once you have opened up a specific cider producer, you can click on the red arrow on the right and get detailed directions. Note: Some cider makers do not have a public tasting location and that will be noted on the record. Come along on the apple’s journey and learn how the six steps of cider making transform the humble apple (and pear) into creative and inspired hard ciders just waiting for us to try. While large commercial orchards may use mechanical harvesting, many cider makers hand-pick the apples for their ciders. That way, the fruit can be picked at optimum ripeness, and picking decisions can be made in orchard, especially where several varieties are grown together. Different apple varieties also ripen at different times, which allows cider makers to create a continuing range of ciders as summer turns to fall and depending on the tastes they want to showcase in a cider. While 2,500 varieties of apples are grown in the United States, and about 100 are grown commercially, the choice of apple for hard cider typically balances tannin with sugar. Step 2: Rinse. Chop. Press. 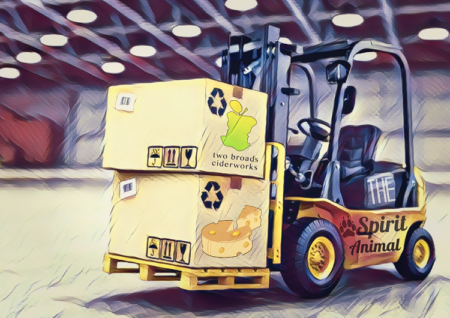 When the bins of apples arrive at the cider crush pad, they’re dumped by forklift into large containers filled with water. First, apples from the water-filled bin are scooped to the conveyor belt, which takes them through the wash section. Here leaves, twigs, and apples not worthy of becoming hard cider are discarded. The apples continue on to the chopper, positioned above a chute that feeds into canvas-lined frame. The chute door is pulled open and the chopped apples fill the frame. When it’s full, the canvas is folded into a neat square, the empty frame is placed on top, and process repeats. When several canvas squares are stacked, they’re positioned under the press. Slowly, the press descends and the apples release their juice. Once the apples are pressed, the unfiltered juice is pumped into fermentation tanks or barrels. Many cidermakers leave the initial juice unfiltered so the fermentable juice matrix will be as raw an interesting as possible at the beginning of the process. It’s easier to filter and clarify later, if and when needed, than to try and blend some intrigue back in to a blend of ciders later on. Cidermakers can choose to ferment a variety of apples at the same time, or ferment each apple variety separately to begin with. This way, they can create different ciders based on the individual characteristics of the variety. They can choose to leave a cider entirely one apple variety, or blend a few finished ciders with tastes that will complement or contrast in a positive way. Ciders are fermented in both stainless steel and wood, which may be new oak, neutral oak, or barrels used previously for wine or spirits, such as bourbon. Container sizes include the typical 60-gallon barrel to 132-gallon puncheons and even the huge 1,200 gallon foudres. All ciders undergo spontaneous fermentation—where the naturally occurring yeasts on the apples start the fermentation process. Since ciders can develop undesirable characteristics pretty quickly, the cidermaker has to keep on top of the fermentation process. That said, cider is also more forgiving than wine fermentation, which is focused on the chemistry. For example, wine is tested throughout fermentation for alcohol level, brix (sugar), free sulpher, and acid level. Depending on the style of cider and its desired result, the cider will be checked a few times each week to be sure fermentation is progressing smoothly. Stainless steel fermentation usually goes more quickly—often finished in three to four weeks—while barrel-aged ciders using wild yeasts can take longer, say three to four months. The fermentation process can result in several outcomes: high pH, lower alcohol, less acid, and so on. All these variations require the cider maker to make decisions about how to use the cider in a finished product. For that reason, making great hard cider is more like following an idea than following a set recipe, and the cider maker learns to bring out the best of each year’s initial fermented batches. The cider maker tastes each cider after fermentation and then makes decisions of how best to use it. While hard ciders don’t have vintages like wine, which reflects the year the grapes were harvested, they can have annual variations in taste. Even a cider made with the same apple variety each year can taste different depending on the fruit from that year’s harvest. Once the cider is finished, it’s bottled (or canned). Some ciders are bottle conditioned with added yeasts. For example, Saison, Champagne, or Brettanomyces yeasts can add different flavors and expressions in the final cider. Now for the fun part: enjoying the fruits of the cider maker’s efforts. But don’t wait too long. Because many craft ciders have small production, they may be gone before you know it. 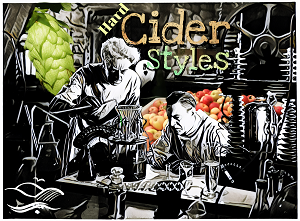 Part of the fun of hard ciders is exploring the range of cider flavors and styles available. Stay curious. You just may find a new favorite. Now that you understand the cider-making process, are you ready to learn the difference between a farmhouse style cider, a scrumpy, or a sidra? Next up: all you ever wanted to know about cider styles. With wines and beers, you’ll generally know what you’ll get when you buy a bottle of Cabernet Sauvignon or Chenin Blanc, an IPA or a stout, even given the individual expression of the wine maker or beer brewer. But with hard ciders, it can be a bit more of a mystery. As long as the product meets the legal definition of cider, modern cider makers are free to create a nearly endless variety of ciders with wide ranges in sweetness levels, carbonation levels, use of other fruits or flavorings (herbs, citrus, hops, etc. ), yeast strains (Champagne or Brettanomyces, for example), and fermentation and aging variables (stainless steel, new or neutral oak barrels, wine or spirit barrels, bottle conditioning). The results can be bone dry to sweet, still to sparkling, with a variety of aromas and tastes from apple-focused to complex and intriguing. And that’s part of the fun of the craft cider world. To help you navigate the major cider styles, here’s a quick look at several of the most common. Modern ciders (some call them draft ciders) are typically made from apple juice concentrate or from fresh-pressed juice of common apples, such as Granny Smith, Gala, Jonathan, and Fuji. Many modern ciders, especially those made with larger commercial production, have an intense apple aroma and flavor. They’re typically medium sweet and carbonated, with alcohol levels usually at 7% or less. They’re easy drinking, refreshing, and often the entryway into the more artistic craft ciders. As their name implies, dry ciders have about 0.5% or less residual sugar and can be considerably more tannic and acidic than modern draft ciders. Some are still and some are carbonated, and aging in oak barrels is used by some cider makers to enhance the natural minerality found in the cider. Other cider makers use neutral oak to stay as close to the apple profile as possible. Some cider makers use these terms to describe the same style of cider; some use the terms to describe different outcomes of cider making in taste and appearance. Others say that farmhouse is the true traditional cider, made to allow the natural fruit and yeasts to come through the finished product with minimal influence from the cider maker: unfiltered, unpasteurized, using naturally occurring wild yeasts, and often made with fruit sourced on their farm or locally—adding an element of terroir to farmhouse cider. No matter which definition we choose, these ciders are the oldest style of cider. They can range in alcohol content between 5 and 12%, not overly sweet, with many bone-dry to off-dry. They usually have good acidity and some tannin. Whether still or sparkling from natural carbonation, they are less carbonated than modern ciders. Colors can range from deep amber to platinum, instead of the predictable light yellow associated with draft cider. The apple flavor is more pronounced, and some traditional or farmhouse ciders use a single variety of apple rather than a blend, which adds even more nuance and depth. (Read more about some favorite cider-making apples in All About Apples.) Aromas and flavors can be influenced by the yeasts and range from floral to funky. These ciders are generally unfiltered and rustic. Similar to farmhouse styles, they are often made to let the natural flavors of fruit and yeast come through. This Spanish cider has been described as sour, musty, and rustic. True Spanish sidras are made in the Asturias and Basque regions in northern Spain from the indigenous crabapple. North American renditions are generally dry, a bit effervescent, and tart, and they can retain their wild yeast characteristics. Not a cider style, but cider’s cousin. Perry is made from pear juice (and ideally from the rare Perry pear, which makes the best perry). Since pears are less acidic than apples, the results can be softer than cider. Perries are made in similar styles as cider, including dry, traditional, and farmhouse. In the UK and Europe, Perry pears are used to make Perry. In the US, Perry pears are very rare, much more so than cider apples, so perry is made from dessert pears. Bartlett and Bosc pears are commonly used in the U.S. for pear cider. You’ve no doubt heard of Red Delicious and Gala apples (and may enjoy eating them), but did you know that some apples are better than others for making cider? Coming up next: all you need to know about apples, from the prized Arkansas Black to the industry workhorse Granny Smith. While there are thousands of apple varieties from around the world, not all apples make great ciders. Dessert apples are yummy eaten raw, and they range from tart to sweet or a combination of flavors. Common dessert apples include McIntosh, Delicious, Gala, Honeycrisp, and Granny Smith. Cider apples, on the other hand, are not so good eaten raw. They may taste dry or bitter, but when used for cider, their qualities add structure, flavor, and depth to hard cider. Cider apples are classified as bittersweets, bittersharps, sharps, and sweet, depending on their balance of tannin and malic acid levels. Here’s a slice of the apples most cherished by cider makers. Arkansas Black: Dark red, almost black. Big, hard, fairly tough skin. Unique dry wine taste. Related to Black Twig. Keeps very well and gets better (sweeter and juicier) in storage. Baldwin: Red, hearty, crisp, plump old-fashioned apple with a sweet-tart flavor. An all-around apple suitable for eating, cooking, cider. Popular in the Midwest. Black Twig: Said to be Andrew Jackson’s favorite apple, with green to yellow skin and streaked with burgundy, its tart taste and tannins make it a great cider apple. It’s also great for cooking and eating. Braeburn: This apple tops the list in many categories: crisp, firm, full of flavor, nice tartness, the best apple for baking whole. It was discovered in Braeburn County, New Zealand and it may grow even better on the Central Coast. It’s high in vitamin C, and it is one of the best apple for a single-variety cider. Calville Blanc: Classic dessert apple from France, and it has twice the Vitamin C as an orange. Great acidic taste. Green with the vertical ribbing of a quince. Golden and Roxbury Russet: Old-fashioned apples and one of the original favorites for making cider. They may not be as pretty as some apples, with their small shape and brown, rough russeting on yellow skin, but the flavor is exceptional and they have intense sweetness. Granny Smith: With a green skin and hard, tart flesh, this apple is great for eating out of hand and it’s used by many cider producers..
Gravenstein: The old-fashioned favorite Gravenstein may be a premier pie apple, but it’s an exceptional cider apple as well. Crisp, juicy, tender, tart, plump and a pretty green with red stripes. Harrison: One of the most renowned cider apples from the past century, its rich yellow flesh makes for a rich, dark cider and is still popular with today’s cider makers. Newtown Pippin: With more flavor and firmness than a Granny Smith, this green apple is tart but sweet. Northern Spy: Who doesn’t love this name? It’s an old-fashioned apple with a superb flavor when slightly green. Spitzenburg: This European variety has proven itself a great apple; in fact, it was Thomas Jefferson’s favorite. Loads of flavor and slightly tart. It’s high in Vitamin C and packed in a big, lovely orange-red package. Wickson: This is a great California cider (and eating) apple, named after E.J. Wickson, distinguished California pomologist. For cider, it’s spicy, sweet, with an acid tang, and especially good for champagne-like ciders. Winesap: The Stayman Winesap is an old favorite. Known for its sharp wine-like flavor, it’s dark red, hard, dense. The Turley Winesap is tart and strong flavored, and a bit more juicy and crisp than the Stayman. And last but so very much not least, how about this wondrous cider apple? Winter Banana: This apple doesn’t look like a banana; rather, its scent has been described as sweet and tropical—like a banana or pineapple. It’s a large yellow apple with pretty red blush. Just like with fine wine and beers, craft ciders have personality. Next: get ready to play and explore the different aspects of cider. No test afterwards, just permission to have fun and see what you can see, smell, and taste. Here are a few ideas to play with. Aromas: Smell the cider. What are the first aromas you get? Floral? Herbal? Earthy? Color: Look at the color. Is it pale, deep, clear, murky? Bubbles: Are there bubbles from carbonation? Is it heavy carbonated? Lightly effervescent? Or is it still? Taste: Now taste the cider. Hold the first sip for about 30 seconds. What do you taste? Do the tastes match the initial aromas? Does the taste change as you hold it? With the next tastes, do you pick up different things? Can you tell if the apples were gathered from an orchard that was next to a eucalyptus grove or in the smoke flume path of a wildfire? Can you taste or smell the naturally occurring yeasts (some may be earthy or funky, but not unpleasant)? Can you taste what type of barrel was used for aging? New oak (vanilla tastes) or neutral oak? Can you tell if the barrel originally held wine, bourbon, or another spirit? For single apple variety ciders, what are the differences between each apple? If other fruit was used during or after fermentation, can you taste it? There are no right or wrong answers with cider tasting. Have fun with it, explore new tastes, and you’ll find your enjoyment of craft cider growing over time.